During World War 2, the Marxes participated in several vehicles in order to raise money or simply to boost the morale, like making guest appearances in movies. 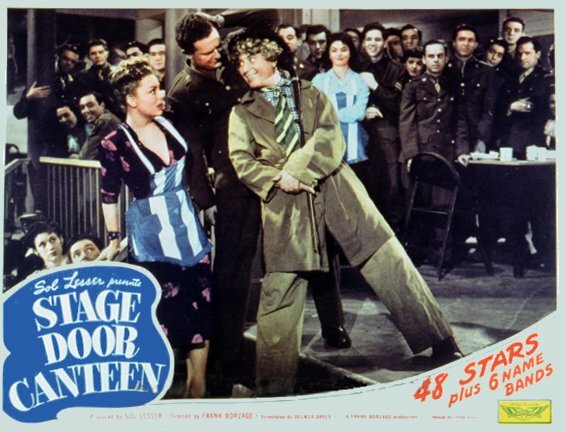 In 1943, Harpo was one of the stars in the film Stage Door Canteen, named after a real-life restaurant ran by the American Theatre Wing in New York for the benefit of soldiers on leave. 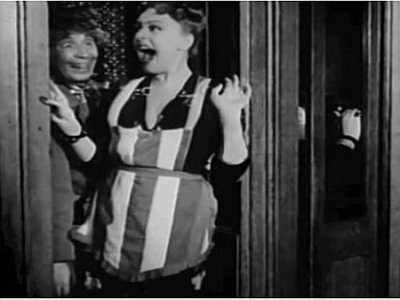 Celebrities like Katharine Hepburn, Edgar Bergen, Tallulah Bankhead, Gracie Fields, Ethel Merman, George Raft , Kenny Baker (seen in At the Circus) and Harpo appear as themselves in this lavish musical about romances that blossom between canteen hostesses and soldiers. The film got two Academy Award Nominations, including Best Song (We Mustn't Say Good Bye). Harpo's scene in Stage Door Canteen is brief, lasting for just a minute. It starts with one of the hostesses of the canteen attempting to make a telephone call, only to find she is sharing the booth with Harpo. She screams and runs and he chases her through the club only to be intercepted by a GI, who insists Harpo should remove his hat when there are ladies present. Harpo obliges, but also leers at the woman who screams and runs off with Harpo following her once again. Some sources claims that Harpo then settled down to play Hoagy Carmichael's Stardust, but this is either a misconception or a scene which has been cut. In the 1945 two-reel War Bond promotion The All-Star Bond Rally, Harpo made an appearance which is almost a continuation of the scene in Stage Door Canteen. The All-Star Bond Rally is set in a theatre with several artists performing. After a song by Frank Sinatra, MC Bob Hope introduces "a brief interlude with the classics", whereupon the stage curtains part to reveal a harp. A girls screams at the back of the theatre and runs down the aisle followed by Harpo honking his taxi horn. 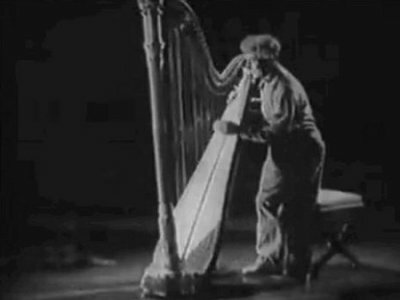 They reach the stage where Harpo forsakes his quarry for the harp. He sits down to play his own composition Guardian Angels and when it's finished he rests his head against the harp as the curtains close once more. The girl screams again and reappears, this time followed by Bob Hope who pauses to deliver a sales pitch for the War Bonds. Both Stardust and Guardian Angels were recorded by Harpo in the 50s, and there are also vocal versions of the latter (with lyrics by Gerda Beilenson) by Mario Lanza and - accompanied by Harpo - Mahalia Jackson.